The Best of Egypt Tours: Experience a fantastic tour to Giza Pyramids, Sphinx and Sakkara before transferring to Aswan for a 4 days cruise down the Nile to Luxor. 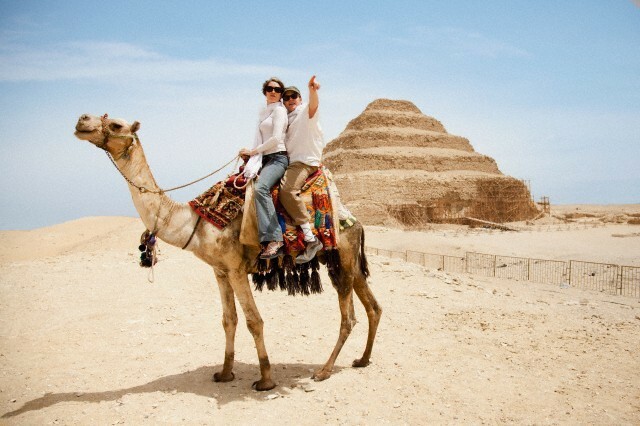 Enjoy a majestic trip on the land of charm and civilization, Sinai. Breakfast at your hotel in Cairo and then meet your personal guide who will accompany you to Giza Plateau to visit the Great Pyramids of Cheops, Chefren and Mykerinus - Famous Sphinx and Valley temple facing the great statue. Additional visit to the Solar Boat infront of Cheops Pyramid (extra ticket on spot) Lunch included during the tour and then proceed to Sakkara area to visit Sakkara Complex and first pyramid ever built (Djoser Pyramid). Later, you will be transferred to Giza railway station to board the sleeper train to Aswan-dinner will be served on board. Overnight inside your compartment. After breakfast on board the train, Egypt Travel representative will meet you at Aswan train station and then you will be transferred by a private A/C vehicle to your Nile Cruise ship for embarkation in Aswan before lunch. Enjoy visiting the world famous High Dam, the beautiful located Temple of Philae on Isis Island ,the Granite Quarries and the Unfinished Obelisk. Dinner on board and overnight in Aswan. Have your breakfast on board during your sail to Luxor, then visit the West Bank and the Valley of the Kings, The temple of Queen Hatshepsut at El-Deir El-Bahari & the Colossi of Memnon. Lunch on board proceeding visiting East Bank (Karnak & Luxor Temples). Enjoy afternoon tea during sailing. Have your dinner on board and overnight in Luxor. Free day in Sharm or join our optional tour to Ras Mohammed National Park which is both a terrestrial and an aquatic nature reserve. The 480 square kilometre protected area lies where the Gulf of Suez meets the Gulf of Aqaba in Sinai's southern extremity. The arid desert terrain of sand dunes, gravel plains, fossilized corals and granite mountains is home to a number of rare mammal species: Dorcas gazelle, Nubian ibex and red fox. Easier to spot are the resident birds like terns, herons, gulls and ospreys. Thousands of white storks pass through Ras Mohammed each year, heading south during September/October and back north during April/May. About 85 flora species live in the park, including mangroves. Overnight in Sharm. Free day in Sharm or join our optional tour to The Monastery of St. Catherine located at the heart of Sinai and at the foot of the Gebel Musa, or Mount Moses. Fronted by gardens and cypress trees, the monastery is owned and run by the Greek Orthodox Church. Its rich library houses the world's second largest collection of illuminated manuscripts after the Vatican. You can see the Burning Bush and a large number of antique works of art: invaluable icons, beautifully carved doors, exquisite wall paintings and other fine religious ornaments. Overnight in Sharm. Start your day visiting the Egyptian Museum, where you will admire the splendid collection of Tutankhamun alongside many other fascinating artifacts. Transfer to visit Salah El Din Citadel which was constructed by Salah El Din in 1183 AD to defend Cairo from the armies of Crusaders. After that visit Mohamed Ali Alabaster Mosque which was designed by the architect Yousif Boushnaq, a Turkish man who came specially from Istanbuland to build this great mosque for Mohamed Ali, the ruler of Egypt (1805-1849) who ruled Over 45 years. Lunch will be taken in a local restaurant. Then proceed to visit Khan El Khalili Bazaar, one of the most famous and oldest bazaars in the Middle East. Visit Old Cairo where you will enjoy, the Hanging Church, Ben Ezra Synagogue, Church of St. Barbara, Church of Abu Serga and back to hotel and overnight in Cairo.